As the oldest person in my family, (I will never mention aloud that the Gracious Mistress of the Parsonage is a wee bit older than myself), it is my duty to pay for all of these Christmas presents. By the time January 1 rolls around, I am just about broke. What good is money if you can’t spend it on your favorite people in all of the world? I won’t say that my family is the best people in all of the world, although it is true, I just won’t say it aloud. What I do like about this period of the year are the delicacies of the season. It is the time of the year to splurge on the finer elements of life. By that, I mean food. I don’t think it’s possible to get too much food during this time of the year. My wife is infamous for looking at me and saying, “Don’t you think you’ve had enough?” Being married as long as I have I only allow her to say, “Don’t you think…” And I stop her right there, shake my head vigorously and say, “No I don’t think. Tis the season not to think.” And I’m not bragging or anything, but when it comes to not thinking I have perfected the art. I have one rule when it comes to this time of the year. Vegetables are completely off my diet. All year long my wife force feeds these wretched vegetables on me as though it was good for my health. The only thing good for my health is to eat them so that she doesn’t badger me as much as she can. But vegetables? At Christmas time? This time of the year is the time for me to exploit the delicious delicacies of the season. I can’t think of any dessert at this time of the year that I don’t indulge in and do it right smartly. Whenever I’m invited to a party, I always manage to bring some kind of dessert. And I don’t bring the dessert for the host. I bring the dessert for me. When you are at a party, it is not polite not to eat the dessert. And I want to be as polite as I can along this line. It was a couple days before Christmas when I realized something rather strange. Of course, being who I am thinking about something strange comes rather normal. But this was something a little different. “Vegetables?” She said somewhat sarcastically. Then I explained what I have not seen this holiday season. They must be around, but I have not run into any this year. 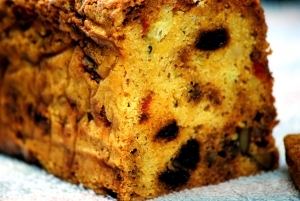 What I have missed this year is the good old fashion Fruitcake. What is the Christmas season without Fruitcake? There was a time when Fruitcake was everywhere you looked and you couldn’t get away from it. Of course, I never tried to get away from Fruitcake. Being the nut that I am, I absolutely love Fruitcake. I know many people make fun of this holiday delicacy. I’m not one of them. I don’t make fun of that which has some special meaning. Only during the holiday season can you get this wonderful, delightful delicacy. Just think about it for a minute. On the one hand, you have “fruit,” and on the other hand, you have “cake.” What two things could merge in such a harmonious marriage of deliciousness? The goodness of the fruit cancels out the badness of the cake. Now when I say badness of the cake, I’m only quoting my wife. I have never seen a cake that was bad, except the one that I can’t eat. Cake is the one thing that makes a gathering worth gathering. Don’t you think it’s a little hypocritical for those people who think a cake is bad, and then have it on certain celebrations? For example. How could you have a wedding without having a wedding cake? I could go on from there if you want me to. No matter what the celebration, cake makes it better. I looked at her and smiled one of those smiles that comes to someone who is happy to be doing what he’s doing at the time and said, “This is not from the world, my dear, this is from heaven.” Then I explained to her what a fruitcake was. I’m not sure she bought the whole story. Life is full of combining things and when combined with other things they take on a new identity. I think life is much like a Fruitcake. Perhaps Jesus said it best, “Take my yoke upon you, and learn of me; for I am meek and lowly in heart: and ye shall find rest unto your souls. For my yoke is easy, and my burden is light” (Matthew 11:29-30). When we combine our life with Jesus we take on His identity.